The painting is even more exceptional considering the lack of interest Witkiewicz had regarding portreting children and the fact that there are to this day, very little double-portraits known painted by him. 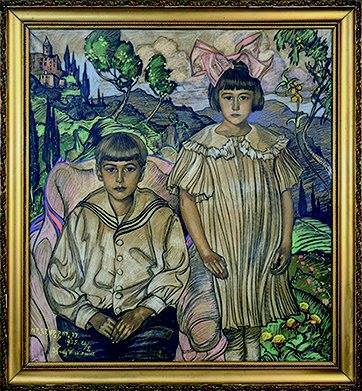 Moreover, the picture was not an ordinary order : the father of the two children was Witkiewicz's friend. Until this day, the masterpiece was exhbitied only twice since it remained the property of the Fisher family during 89 years. The Fishcer family were very attached to Zakopane, and so was the grand-father of the children, Ferdinand Tabeau. He hold the first pharmacy of Zakopane in the 19th C. which was situated on Krupówki, where the actual n°19 is situated. He is also the one to have financed the expeditions of the anthropologist Bronislaw Malinowski to the Antipodes in which he was joined by Witkiewicz. The painting, which was bought to Ludwik Fischer's son at the occasion of the 125th anniversary of the museum for the price of 250.000 zl, is coming to complete a collection that gathers already more than 80 pieces from Witkiewicz. The purchase was financed by the Voivodina of Malopolska.